After the design stage you should have a pretty strong idea as to what you want your quilt to look like in its final form. You now need to choose a pattern. There are literally millions of blocks to choose from, and you can easily create your own. If you need help or inspiration for designs make sure to look at our quilt patterns section. After your pattern has been chosen, you need to consider fabrics and colors: What type of fabric do you want to use? What do you want it to be made of? What colors? Firstly, choose the type of material. 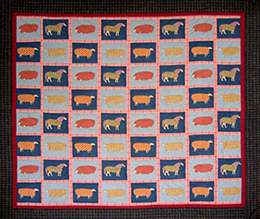 Most quilts are made from 100% cotton or cotton mixes. Cotton is a very versatile, strong and natural material to work with, it is generally allergy free and is not flammable, unlike some man-made fibres such as rayon and polyester. So if you are making the quilt for a child’s bed then this could be a huge consideration! Synthetics and cotton mixes are sometimes a little more difficult to work with as they crease and pucker far more than 100% cotton does, however they are available in a really fantastic range of bright colors and pastels and can be very stunning in appearance. Synthetics can be difficult to quilt however as they have a “spongy” feeling, so if you are a beginner try to use 100% cotton or cotton mixes if you can. When choosing the color and pattern, it is a great idea to consider what kind of mood you would like the quilt to create. Don’t just look at the tangible aspect like who it is for and where it is going, also consider the reason people will be using it and how you would like them to feel when they are wrapped up or lying under one of your beautiful quilts. Many quilters who are making a quilt for a friend, loved one or someone special will use some material from that persons life – material that might mean something to the receiver. It could be the material from their favour old dress or their children’s clothes, cotton from their favourite set of sheets (which may now have a hole or two! ), their husbands work shirts, grandma’s handkerchiefs or simply a beautiful piece of fabric that caught your eye one day. When choosing the type of fabric and color scheme you need to integrate the color into your chosen pattern. It is always a good idea to just add up how much fabric of each color and type of fabric that you have, just so you don’t end up planning to use your favourite type to make a wide boarder and then finding out later that you only having enough for 3 sashes! Likewise, if you are making a central motif or there is a particular fabric that you want to feature on your quilt, make sure to work out whether you have enough to cover the area. A great tip is to always buy a little more than you think you are going to use. That way you will be safe from running short and after you have made a couple of different quilts you can make a Rag quilt where you use all the scraps from your quilts to make a bright colorful and inexpensive quilt (and you won’t have to buy a thing!). Remember when quilting and slotting your fabrics and colors into your pattern that, while some fabrics look fantastic in sheets, they not always have the same effect when cut into 2″x2″ or even 5″x5″ squares and may not give the same appeal as a whole piece of material. Likewise fabric that you feel is ‘boring’ or don’t particularly like may often look fantastic when in tiny squares or used as appliqué rather than as a large block of color. Remember also when using patterned fabric to make small squares or geometric shapes, that these must be cut very accurately (particularly those with a repetitive geometric pattern such as little dots or flowers) as if you happen to run of course and go slightly askew it will be very obvious, as generally the human eye is very good at spotting a straight line, or in this case a not-so-straight line! When considering color and tone you might want to remember that warmer colors – reds, yellows, oranges, purples and anything with a lot of red in it always appear closer, whereas cool colors – blues, greens, and bluey-purples will appear further away. Warmer colors tend to make people more alert and active and cooler colors are much more soothing (as is earth tones) and will calm and quieten someone. Always make sure to think about these subliminal effects you might want to consider putting a brighter color quilt in a lounge room or as a wall hanging and leave the cooler colored quilts to the bedroom … but that is up to you! Please make sure your fabrics are colorfast and not too heavy or too light. If you fabric is really heavy, like denim or canvas, then it will be very difficult to quilt. On the other hand, if it is woven too loose, like organza, then it will be very flimsy and also difficult to quilt!